In a complex society like ours, lawyers are found everywhere. Your advantage of studying law at WPI is that students trained as scientists and engineers can find rewarding careers where law and technology meet, a niche that is desirable in the industry and not always met by the law school applicant pool. From intellectual property law creating rights in technology to environmental law specifying methods for handling hazardous wastes to telecommunications law controlling access to radio frequencies used by satellites or cell phones, WPI grads have a special advantage as lawyers. WPI can prepare you to pursue many types of law, so we ensure we are with you every step of the way to provide the expert preparation needed for a law career. We equip you with important resources such as specialized advising and networking opportunities. Most importantly, the innovative WPI projects program helps you to develop the skills that law schools seek to make you stand out from the pack. 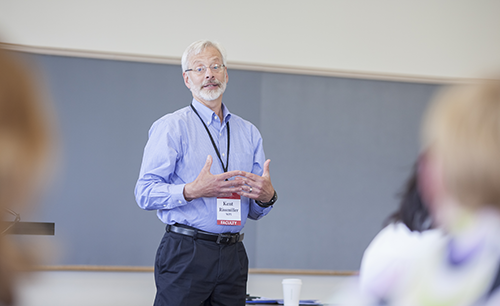 Professor Kent Rissmiller is the pre-law advisor to WPI students and alumni and provides expert guidance to ensure you complete all requirements and important actions like law school selection, applications, and the LSAT. Professor Rissmiller has had the unusual experience of attending both the Washington College of Law at American University and the Franklin Pierce Law Center, where he earned his J.D. in 1980. He worked for three years as a lawyer for the Public Service Commission of Nevada. He holds a Ph.D. in Political Science from Syracuse University. He is also a member of the bar in Massachusetts and of the Federal District Court for the District of Massachusetts. The Pre-law Society (also sometimes known as the Law and Social Issues Group) provides an opportunity for pre-law students to become acquainted and share interests. The Society invites speakers like patent lawyers, law school faculty, judges, public defenders, and law school admissions officers to campus to share their expertise in a legal subject or their career experience as lawyers. The Society also forms mock trial teams to compete in the American Mock Trial Association's regional tournaments, in which students are given a great opportunity to learn rules of trial procedure and rules of evidence, and engage in public speaking - all as they try to persuade a set of judges to accept their version of events. Our project-based curriculum will equip you with critical thinking and reasoning skills that will make you an outstanding candidate for even the most competitive law school. In your junior year, you will undertake an Interactive Qualifying Project (IQP) in which you investigate, analyze, and implement solutions to a real societal challenge involving law, at home or abroad. Projects in Law and Technology (IQP Division 52) give students the chance to study the legal and political controversies that arise from the use of technology, the regulation of technology, or the impact of technology (like DNA testing) on legal institutions. Sometimes, pre-law students use the IQP to further some interest in a legal subject, but these projects are not reserved for pre-law students. Some project ideas originate with students, such as the First Amendment and attempts to regulate Internet content or regulations applicable to dietary supplements, and others originate originated with local sponsors in the Worcester legal community like the Legal Assistance Corporation of Central Mass and the Massachusetts District Court - Worcester Division. So much legal practice is related to science and technology, and WPI gives you a solid technical background.